The technical notes listed below are currently available online. For TechNotes not listed here, contact us and we'll mail or fax a paper copy. Flangeless fittings with collapsible ferrule Instructions for installing Cheminert flangeless fittings with CTFE or PEEK one-piece collapsible ferrules. TN 505a Instructions for installing Cheminert flangeless fittings with CTFE or PEEK one-piece collapsible ferrules. installation and use	Nanovolume1/32” fittings incorporate a grooved ferrule designed to break away from the nut as the ferrule starts to grip the tubing. TN 507 Nanovolume1/32” fittings incorporate a grooved ferrule designed to break away from the nut as the ferrule starts to grip the tubing. installation and use Cheminert high pressure 360 micron fittings, consisting of a nut with snap-in ferrule, permit direct connection of 360 micron OD stainless, PEEK, fused silica, or electroformed nickel tubing. TN 509 Cheminert high pressure 360 micron fittings, consisting of a nut with snap-in ferrule, permit direct connection of 360 micron OD stainless, PEEK, fused silica, or electroformed nickel tubing. 360µm to 1/16" fitting (C360IZR1) The Cheminert C360IZR1 connects a 360 µm fused silica tube directly into a 1/16” fitting detail. TN 512 The Cheminert C360IZR1 connects a 360 µm fused silica tube directly into a 1/16” fitting detail. EZR and IZR installation instructions EZRs adapt an external tee or union or Parker and Swagelok® type fittings to Valco ZDV connections. IZRs are most commonly used for adapting small transfer lines to Valco valves with larger fittings. TN 504 EZRs adapt an external tee or union or Parker and Swagelok® type fittings to Valco ZDV connections. IZRs are most commonly used for adapting small transfer lines to Valco valves with larger fittings. Fused silica adapters, installation and use Valco fused silica adapters permit easy use of open tubular columns with Valco valves, and provide direct connection of fused silica within Valco fittings for maximum bore uniformity and inertness. TN 501 Valco fused silica adapters permit easy use of open tubular columns with Valco valves, and provide direct connection of fused silica within Valco fittings for maximum bore uniformity and inertness. IZERA1.5 installation instructions Valco IZERA1.5 and IZERA1.5M fittings are unique 1/16” internal to 1/32” external adapters, designed to eliminate graphite ferrules getting stuck in 1/32” internal fitting details. A typical application is the connection of a fused silica capillary to a valve or detector. TN 506 Valco IZERA1.5 and IZERA1.5M fittings are unique 1/16” internal to 1/32” external adapters, designed to eliminate graphite ferrules getting stuck in 1/32” internal fitting details. A typical application is the connection of a fused silica capillary to a valve or detector. Zero dead volume (ZDV) fitting instructions Since leak-tightness and integrity of the fitting are dependent upon tubing preparation and proper assembly, this publication addresses those two topics. TN 503 Since leak-tightness and integrity of the fitting are dependent upon tubing preparation and proper assembly, this publication addresses those two topics. Zero dead volume fill port fittings How to use the Valco ZVISF-1, a unique fill port fitting designed so that the required leaktight seal is formed against the face of the bottom of the fitting detail instead of at the end of an angular ferrule. TN 510 How to use the Valco ZVISF-1, a unique fill port fitting designed so that the required leaktight seal is formed against the face of the bottom of the fitting detail instead of at the end of an angular ferrule. Lapping the ends of fused silica tubing Normal methods of cutting fused silica leave a high spot, which can cause problems in applications requiring minimal dead volume. The VICI Fused Silica Prep kit includes everything needed to polish the burred end into a clean, perfectly square-cut surface. TN 621 Normal methods of cutting fused silica leave a high spot, which can cause problems in applications requiring minimal dead volume. The VICI Fused Silica Prep kit includes everything needed to polish the burred end into a clean, perfectly square-cut surface. Cleaning or Replacing a Pulsed Discharge Detector Ground Pin Detector sensitivity can often be restored by removing and cleaning the ground pin; however, in some cases the ground pin must be replaced. TN 620 Detector sensitivity can often be restored by removing and cleaning the ground pin; however, in some cases the ground pin must be replaced. Two position and multiposition valves Describes how to remove the valve from the purge housing for cleaning or shaft and seal replacement. TN 602 Describes how to remove the valve from the purge housing for cleaning or shaft and seal replacement. Model 100 upstream-referenced fixed span flow controller Covers specifications, dimensions, and flow rates and characteristics. TN 613 Covers specifications, dimensions, and flow rates and characteristics. Model 202 upstream-referenced adjustable span flow controller Covers specifications, dimensions, flow rate setting, and flow characteristics. TN 614 Covers specifications, dimensions, flow rate setting, and flow characteristics. Model 300 downstream-referenced fixed span flow controller	Covers specifications, dimensions, and flow rates and characteristics. TN 615 Covers specifications, dimensions, and flow rates and characteristics. User guide How to select a serial port, create a new method file, open and edit a file, and run a method. TN 618 How to select a serial port, create a new method file, open and edit a file, and run a method. Cheminert HPLC and UHPLC injectors Includes initial precautions and instructions for disassembly, cleaning, inspecting, and reassembling. TN 801 Includes initial precautions and instructions for disassembly, cleaning, inspecting, and reassembling. Nanovolume® models CN2 and CN4 Includes initial precautions and instructions for disassembly, cleaning, inspecting, and reassembling. TN 813 Includes initial precautions and instructions for disassembly, cleaning, inspecting, and reassembling. Models C22, C24, C25, C22Z, C24Z, and C25Z Includes initial precautions and instructions for disassembly, cleaning, inspecting, and reassembling. TN 811 Includes initial precautions and instructions for disassembly, cleaning, inspecting, and reassembling. Models C35Z and (obsolete) C45 Includes initial precautions and instructions for disassembly, cleaning, inspecting, and reassembling. Also includes alignment instructions for the C35Z. TN 816 Includes initial precautions and instructions for disassembly, cleaning, inspecting, and reassembling. Also includes alignment instructions for the C35Z. Model C42R Includes initial precautions and instructions for disassembly, cleaning, inspecting, and reassembling. TN 828 Includes initial precautions and instructions for disassembly, cleaning, inspecting, and reassembling. Model C45R Includes initial precautions and instructions for disassembly, cleaning, inspecting, and reassembling. TN 826 Includes initial precautions and instructions for disassembly, cleaning, inspecting, and reassembling. Models C1 and C1CF Includes information about panel mounting, connecting the fittings, sample loading, and position feedback, as well as instructions for disassembly, cleaning, inspecting, and reassembling. TN 802 Includes information about panel mounting, connecting the fittings, sample loading, and position feedback, as well as instructions for disassembly, cleaning, inspecting, and reassembling. Model C25G Includes initial precautions and instructions for disassembly, cleaning, inspecting, and reassembling. Also has instructions for the special 6-40 fittings. TN 824 Includes initial precautions and instructions for disassembly, cleaning, inspecting, and reassembling. Also has instructions for the special 6-40 fittings. Models C52, C62, and C62Z Includes initial precautions and instructions for disassembly, cleaning, inspecting, and reassembling. Also details about dimensions, electrical connections, motor control modes, and optional serial control. TN 819 Includes initial precautions and instructions for disassembly, cleaning, inspecting, and reassembling. Also details about dimensions, electrical connections, motor control modes, and optional serial control. Models C55, C65, and C65Z Includes initial precautions and instructions for disassembly, cleaning, inspecting, and reassembling. Also details about dimensions, electrical connections, motor control modes, and optional serial control. TN 821 Includes initial precautions and instructions for disassembly, cleaning, inspecting, and reassembling. Also details about dimensions, electrical connections, motor control modes, and optional serial control. Selectors, air- and electrically-actuated Includes initial precautions and instructions for disassembly, cleaning, inspecting, and reassembling. Also how to implement their use on air and standard electric actuators, including alignment instructions. TN 814 Includes initial precautions and instructions for disassembly, cleaning, inspecting, and reassembling. Also how to implement their use on air and standard electric actuators, including alignment instructions. Loop fill port assembly Installation and use, including mounting the valve and installing the tubing. TN 806 Installation and use, including mounting the valve and installing the tubing. 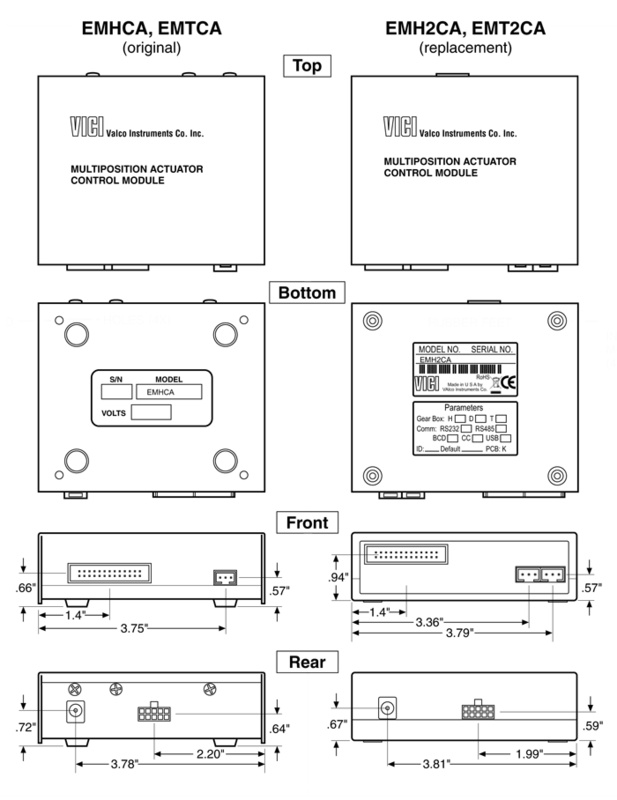 Models DV-12 and DV-22 Instructions for installation and operation. TN 605 Instructions for installation and operation. Models DV-12 and DV-22 How to install a replacement diaphragm. TN 606 How to install a replacement diaphragm. Installing a loop General instructions for loop installation on a C6W. TN 105 General instructions for loop installation on a C6W. Installing a microvolume loop (20 µl or less) Tips for installing the smallest-volume loops (shortest length of tubing) on C6Ws. TN 104	Tips for installing the smallest-volume loops (shortest length of tubing) on C6Ws. Internally purged valves Valco internally purged two position and selector models have additional ports for a purge gas as well as O-ring seals on the rotor and driver to eliminate any possible diffusion from the atmosphere into the valve, or to safely vent fugitive emissions from the valve. TN 107 Valco internally purged two position and selector models have additional ports for a purge gas as well as O-ring seals on the rotor and driver to eliminate any possible diffusion from the atmosphere into the valve, or to safely vent fugitive emissions from the valve. Operating notes and cleaning instructions	Includes initial precautions and instructions for disassembly, cleaning, inspecting, and reassembling. Also details conditioning procedure for high temperature valves and special instructions for high pressure W and UW valves. TN 201 Includes initial precautions and instructions for disassembly, cleaning, inspecting, and reassembling. Also details conditioning procedure for high temperature valves and special instructions for high pressure W and UW valves. Valve alignment troubleshooting	Causes and symptoms of misalignment between a 2 position valve and actuator, and a procedure to restore proper alignment. TN 101	Causes and symptoms of misalignment between a 2 position valve and actuator, and a procedure to restore proper alignment. Mounting 10 port W valves Discusses breakthrough of threads into mounting holes, old and new design. TN 103	Discusses breakthrough of threads into mounting holes, old and new design. Manual feedback assembly  W valves	The PFW, comprising a knob with a socket head set screw and a bearing plate with a contact and signal cable, provides position feedback for two position manually-actuated valves in the form of a permanent contact closure for TTL logic signals at Position B.
TN 106	The PFW, comprising a knob with a socket head set screw and a bearing plate with a contact and signal cable, provides position feedback for two position manually-actuated valves in the form of a permanent contact closure for TTL logic signals at Position B.
Dual internal volume injector	Special instructions for W and UW internal volume sample injectors with two sample sizes – how to rotate the rotor to change the sample size, and how the sample slots are oriented relative to the rotor tab and rotor polymer ID letter. TN 208	Special instructions for W and UW internal volume sample injectors with two sample sizes – how to rotate the rotor to change the sample size, and how the sample slots are oriented relative to the rotor tab and rotor polymer ID letter. UW and MW valves on microelectric and universal actuators (keyed hardware) Includes alignment instructions for UW and MW valves on microelectric and universal actuators with keyed hardware. TN 715	Includes alignment instructions for UW and MW valves on microelectric and universal actuators with keyed hardware. MW valves on air actuators For selector valves with legacy unkeyed mounting hardware. TN 707	For selector valves with legacy unkeyed mounting hardware. MW valves on standard electric actuators For selector valves with legacy unkeyed mounting hardware. TN 708	For selector valves with legacy unkeyed mounting hardware. UW valves on air actuators For selector valves with legacy unkeyed mounting hardware. TN 705 For selector valves with legacy unkeyed mounting hardware. UW valves on standard electrical actuators For selector valves with legacy unkeyed mounting hardware. TN 706	For selector valves with legacy unkeyed mounting hardware. High temperature valves Includes alignment instructions for legacy unkeyed mounting hardware. TN 704 Includes alignment instructions for legacy unkeyed mounting hardware. Low temperature valves Includes alignment instructions for legacy unkeyed mounting hardware. TN 703 Includes alignment instructions for legacy unkeyed mounting hardware. Actuator considerations for Valco column selectors CST4UW and CST6UW valves These two products are the exceptions to the rule that the number of positions of the actuator is indicated by the product number. TN 709	These two products are the exceptions to the rule that the number of positions of the actuator is indicated by the product number. P and E Series valves Includes initial precautions and instructions for disassembly, cleaning, inspecting, and reassembling. TN 304 Includes initial precautions and instructions for disassembly, cleaning, inspecting, and reassembling. P and E Series VL type valves	Includes initial precautions and instructions for disassembly, cleaning, inspecting, and reassembling. TN 310	Includes initial precautions and instructions for disassembly, cleaning, inspecting, and reassembling. T Series valves Includes initial precautions and instructions for disassembly, cleaning, inspecting, and reassembling. Also details conditioning procedure for high temperature valves. TN 305 Includes initial precautions and instructions for disassembly, cleaning, inspecting, and reassembling. Also details conditioning procedure for high temperature valves. High temperature valves	Includes alignment instructions for legacy unkeyed mounting hardware. TN 704	Includes alignment instructions for legacy unkeyed mounting hardware. Low temperature valves	Includes alignment instructions for legacy unkeyed mounting hardware. TN 703	Includes alignment instructions for legacy unkeyed mounting hardware. Mounting instructions	How to mount a BNV1 or ZBNV1, and how to replace a screen in a ZBNV1. TN 603 How to mount a BNV1 or ZBNV1, and how to replace a screen in a ZBNV1. Air actuated, installation and use	Describes the various configurations available, and offers instructions for mounting and actuation. TN 607 Describes the various configurations available, and offers instructions for mounting and actuation. Manually operated, installation and use Describes the various configurations available, and offers instructions for mounting and actuation. TN 609 Describes the various configurations available, and offers instructions for mounting and actuation. TN 608 Describes the various configurations available, and offers instructions for mounting and actuation. TN 610 Describes the various configurations available, and offers instructions for mounting and actuation. Installation and use	Describes the various configurations available, and offers instructions for mounting and actuation. TN 616 Describes the various configurations available, and offers instructions for mounting and actuation. O-ring replacement How to install O-ring kit OR or ORT to repair a leaking actuator. TN 409 How to install O-ring kit OR or ORT to repair a leaking actuator. Digital Valve Interface (DVI) implementaion Installing a DVI – an electronic controller which converts low power logic level signals or contact closures into pneumatic pulses for the operation of Valco two position air actuated valves. TN 411 Installing a DVI – an electronic controller which converts low power logic level signals or contact closures into pneumatic pulses for the operation of Valco two position air actuated valves. High Speed Switching Accessory (HSSA) implementation The high speed switching accessory (HSSA) provides increased air or helium flow for the fast actuation required in partial loop injections or microbore chromatography. TN 412 The high speed switching accessory (HSSA) provides increased air or helium flow for the fast actuation required in partial loop injections or microbore chromatography. Position Feedback (PFAF) implementation The PFAF can be installed on any VICI two position air actuator (30° - 90°). In each position, the PFAF offers a permanent contact closure for TTL logic signals. TN 419 The PFAF can be installed on any VICI two position air actuator (30° - 90°). In each position, the PFAF offers a permanent contact closure for TTL logic signals. Implementation - older solenoids	Use of a 4-way solenoid (41E1 or 41E1-CE) is recommended for multiposition actuators. In this implementation air is continuously applied to the actuator, which is directed to step or reset by the solenoid. TN 406 Use of a 4-way solenoid (41E1 or 41E1-CE) is recommended for multiposition actuators. In this implementation air is continuously applied to the actuator, which is directed to step or reset by the solenoid. Implementation - current solenoids	Use of a 4-way solenoid (Model 410 or V-SV-S52) is recommended for multiposition actuators. In this implementation air is continuously applied to the actuator, which is directed to step or reset by the solenoid. TN 426 Use of a 4-way solenoid (Model 410 or V-SV-S52) is recommended for multiposition actuators. In this implementation air is continuously applied to the actuator, which is directed to step or reset by the solenoid. O-ring replacement	How to install O-ring kit ORMP or ORTMP to repair a leaking actuator. TN 410 How to install O-ring kit ORMP or ORTMP to repair a leaking actuator. Multiposition air actuator position indicator switch	Installation of a position indicator switch, typically used to supply inputs to a digital system or to power an LED readout requiring a maximum of 0.5 amps at 28 VDC. TN 430 Installation of a position indicator switch, typically used to supply inputs to a digital system or to power an LED readout requiring a maximum of 0.5 amps at 28 VDC. Models EUH, EUD, and EUT Covers mounting and dimensions, cabling, and control via the standard interface or optional serial or BCD interface. Manual Covers mounting and dimensions, cabling, and control via the standard interface or optional serial or BCD interface. USB tutorial part 3: Verifying actuator communication	Step-by-step instructions for establishing and verifying serial communication. TN 420-3 Step-by-step instructions for establishing and verifying serial communication. Universal Actuator and Power Supply Assembly	Cable PN I-25418 must be inserted between the universal actuator assembly and the power supply. TN 427 Cable PN I-25418 must be inserted between the universal actuator assembly and the power supply. Using Valco Electric Actuators with Sciex Analyst® Software Sciex Analyst LC-MS/MS acquisition software for TripleQuad and QTRAP instruments is fully compatible with Valco two-position microelectric actuators. Also explains how to use universal actuators in legacy mode. TN 428 Sciex Analyst LC-MS/MS acquisition software for TripleQuad and QTRAP instruments is fully compatible with Valco two-position microelectric actuators. Also explains how to use universal actuators in legacy mode. Setting a Universal Actuator for Operation in Legacy Mode The universal actuator in its legacy mode emulates the behavior and responses of microelectric actuators. This allows them to be used with lab software products designed to incorporate VICI microelectric actuators, but not the newer VICI universal actuators. TN 429 The universal actuator in its legacy mode emulates the behavior and responses of microelectric actuators. This allows them to be used with lab software products designed to incorporate VICI microelectric actuators, but not the newer VICI universal actuators. EM2C controller, installation and use (EM2C controller was obsoleted in 2010; newer models refer to TN 421) Includes descriptions of cable and connector functions, mounting instructions, and how to control the actuator digitally or through a serial interface. TN 413 Includes descriptions of cable and connector functions, mounting instructions, and how to control the actuator digitally or through a serial interface. E2CA controller, installation and use Includes descriptions of cable and connector functions, mounting instructions, and how to control the actuator digitally or through a serial interface. TN 421 Includes descriptions of cable and connector functions, mounting instructions, and how to control the actuator digitally or through a serial interface. EM2C, forced initialization procedure	How to reinitialize a Valco microelectric actuator after the valve has been loosened or removed, or when the actuator controller has been replaced. TN 413a How to reinitialize a Valco microelectric actuator after the valve has been loosened or removed, or when the actuator controller has been replaced. EMHCA or EMTCA, installation and use (EMHCA and EMTCA controllers were obsoleted in January of 2019; newer models refer to TN 435) Includes descriptions of cable and connector functions, mounting instructions, and how to control the actuator with the manual controller, or via digital or serial control. TN 415 Includes descriptions of cable and connector functions, mounting instructions, and how to control the actuator with the manual controller, or via digital or serial control. Quick start guide	Includes descriptions of cable and connector functions, mounting instructions, and how to control the actuator with the manual controller. Also a basic method of control via an external system. TN 415QS Includes descriptions of cable and connector functions, mounting instructions, and how to control the actuator with the manual controller. Also a basic method of control via an external system. Change Summary: Multiposition microelectric actuator controller Description of changes to the multiposition microelectric actuator controller, as well as the purpose and the effects. TN 434 Description of changes to the multiposition microelectric actuator controller, as well as the purpose and the effects. EMH2CA or EMT2CA, installation and use Includes descriptions of cable and connector functions, mounting instructions, and how to control the actuator with the manual controller, or via digital or serial control. TN 435 Includes descriptions of cable and connector functions, mounting instructions, and how to control the actuator with the manual controller, or via digital or serial control. TN 435QS Includes descriptions of cable and connector functions, mounting instructions, and how to control the actuator with the manual controller. Also a basic method of control via an external system. Installation and use	General description plus how to control with the manual controller, or automated control by a data system capable of generating contact closure or negative true logic level signals. TN 417 General description plus how to control with the manual controller, or automated control by a data system capable of generating contact closure or negative true logic level signals. Modifications	How to make fine adjustments to the stroke distance, or change it to work with a valve with a different number of ports of positions. Manual How to make fine adjustments to the stroke distance, or change it to work with a valve with a different number of ports of positions. TN 418 General description plus how to control with the manual controller, or automated control by a data system capable of generating contact closure or negative true logic level signals. Models E-VI Includes descriptions of cable functions, mounting instructions, and various methods of controlling the industrial electric actuator, which is dedicated to industrial applications for manufacturers of in-process analytical instruments for heavy industry. TN 432 Includes descriptions of cable functions, mounting instructions, and various methods of controlling the industrial electric actuator, which is dedicated to industrial applications for manufacturers of in-process analytical instruments for heavy industry. For air or electric actuators	How to remove the valve and mounting hardware from the actuator and put it back together with proper alignment between valve and actuator. TN 403 How to remove the valve and mounting hardware from the actuator and put it back together with proper alignment between valve and actuator. Manual actuation assembly for two position W and UW valves How to remove or install the closemount manual hardware on a Valco two position W or UW valve. TN 401 How to remove or install the closemount manual hardware on a Valco two position W or UW valve. Installing a Cheminert Selector on a Clamp Ring A few simple tips can help you avoid any problems or damage when reinstalling a valve on an actuator. TN 422 A few simple tips can help you avoid any problems or damage when reinstalling a valve on an actuator. For air or electric actuators	Includes instructions about installing the valve/actuator/standoff assembly on an instrument. Also shows how to separate the valve, standoff, and actuator and get it all back together with proper alignment between valve and actuator. TN 404 Includes instructions about installing the valve/actuator/standoff assembly on an instrument. Also shows how to separate the valve, standoff, and actuator and get it all back together with proper alignment between valve and actuator. For manual actuation	How to remove or install a standoff and handle or knob. TN 402 How to remove or install a standoff and handle or knob. Descriptions and Applications Illustrations, dimensions, and functions of the various VICI clamp rings. TN 431 Illustrations, dimensions, and functions of the various VICI clamp rings. Rheodyne adapter kit installation instructions The Rheodyne adapter kit (RAK) permits a Rheodyne HPLC injector (Series 7000-9000) to be installed on a Valco two position microelectric actuator. TN 416 The Rheodyne adapter kit (RAK) permits a Rheodyne HPLC injector (Series 7000-9000) to be installed on a Valco two position microelectric actuator.